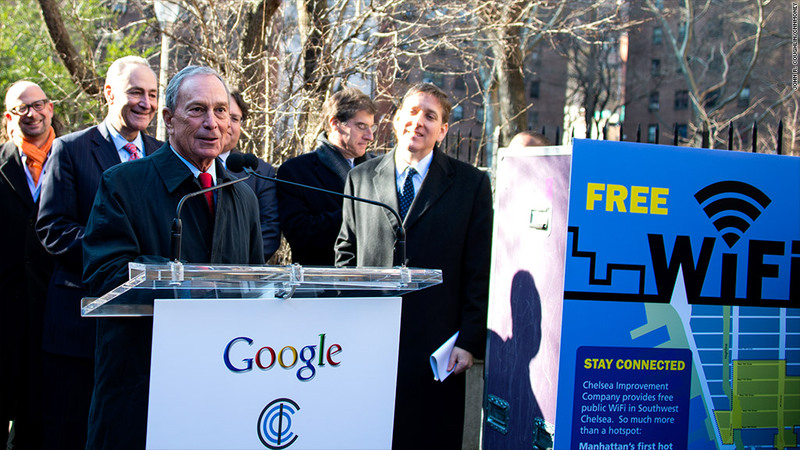 New York Mayor Michael Bloomberg, with Sen. Charles Schumer (left) and Google Chief Information Officer Ben Fried (right), unveiled a free public Wi-Fi service for the Chelsea neighborhood of New York. In a joint press conference with New York Mayor Michael Bloomberg and New York Senator Charles Schumer, Google (GOOG) said it hoped to keep the tens of thousands of residents, and millions of tourists, in the area connected at all times when they're outdoors. Google also will be providing indoor coverage for public housing units in the area. The announcement comes at a time when Google's broadband offerings are being closely tracked by both citizens and politicians eager for tech infrastructure upgrades. The company recently brought high-speed fiber-optic Internet coverage to the Kansas City area, capable of download speeds up to 1 Gigabit per second. That's about 200 times faster than your average home broadband connection. 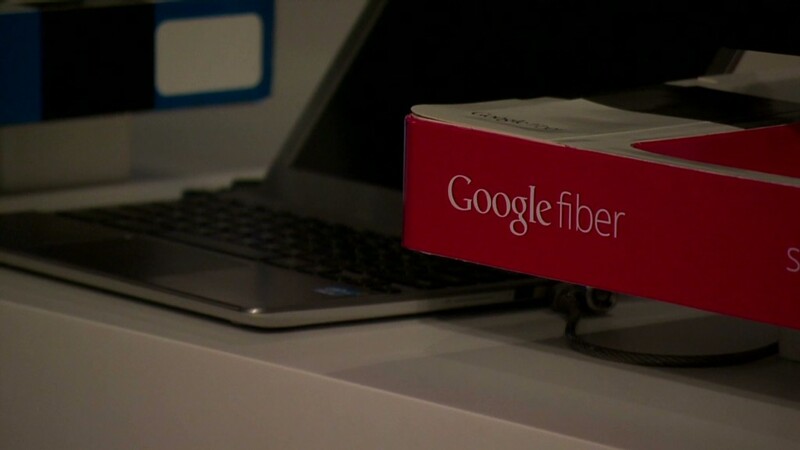 Tired of slow Internet speeds, high costs and few choices in providers, Americans have been eagerly watching for any hints that Google would expand its fiber offering to their hometowns. Google's Wi-Fi has impressive speeds of its own -- about 5 to 10 Megabits per second, or around the same as a typical home Internet connection. But Ben Fried, Google's chief information officer, said in unequivocal terms that the Wi-Fi offering is not a harbinger of bigger things to come for New Yorkers. "This has no relation to Google Fiber," Fried said. "We're citzens of this community, and we felt that it was important to contribute." Still, here's a tantalizing tidbit that makes the project of interest outside Chelsea: Google said it cost just $115,000 to get all the technology installed for the venture, which carries a $45,000 annual maintenance cost. The company covered two-thirds of the expense, and the Chelsea Improvement Company, a local public advocacy group, paid for the other third. That low price tag excited the public officials participating in the press conference. "It's not very expensive at all -- just a smidgeon of what Sandy cost," said Schumer. "The mayor and I said maybe we could get this done for all of New York. We look forward to the day when all of New York has free Wi-Fi." Bloomberg noted that even as the cost of wireless communications goes down, its usage is soaring, which adds to the overall cost of maintaining the networks. New York currently has free Wi-Fi in 20 parks across its five boroughs, but this is the first time such a large-scale, public Wi-Fi project has been attempted in a densely populated urban area. Google said it faced geographic and technological challenges in building the network, including the problem of sending signals across a wide area with very tall buildings in the way. Google has offered Wi-Fi to certain areas before. It has been providing Mountain View, Calif., with free Wi-Fi for several years, as part of what it calls "ongoing efforts to reach out to our hometown." (Google is headquartered in Mountain View.) It also teamed up with Wi-Fi providers like Boingo Wireless (WIFI) on a temporary basis to provide service to some New York subway stations, airports and other areas. Building infrastructure is challenging and expensive, but it's a problem Google is financially motivated to tackle. It makes money when people are connected and searching the Web, giving the company an incentive to provide fast and ubiquitous connectivity. The 13-block coverage zone in Chelsea includes certain areas between Gansevoort St. and West 19th Street, from 8th Avenue to 10th Avenue.